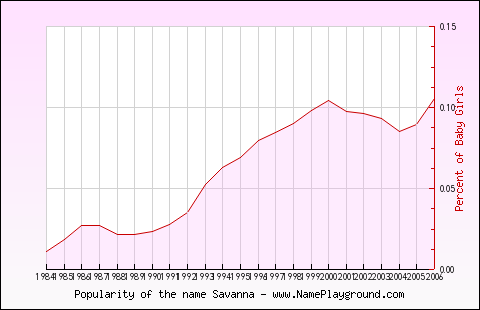 Savanna is represented in the Top 1000 exclusively as a girls' name. Note: Only names in the Top 1000 for each year are represented. [source] Values are normalized for boys and girls to compare trends (vertical scales differ for boys and girls). Names Using All Letters of, and Only Letters in "Savanna"
Names Using Only Letters In "Savanna"
Names Using All Letters In "Savanna"
Get this book if you have a friend named “Savanna”! This amazing book explains how the sound of a person&apos;s name can affect their personality! It lists each name and the corresponding personality profile. Spooky and fascinating!